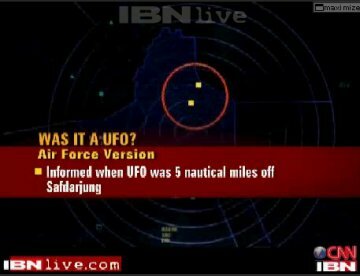 2 UFOs were seen on the ATC Radar at the Safdarjung Airport in New Delhi on the 7th of March 2007, just 2 kms away from the Prime Ministers residence ! The news telecast on CNN-IBN of the UFOs is one of the first major UFO sightings reported on National Network ... Hope to see some more Truth being shared, gently lifting the veil of secrecy and government cover ups ... People will sooner or later have to deal with the Truth ! The ATC team was in a tizzy after the aircraft, spotted 37 nautical miles east of the airport around 3.30am, appeared not to have any transponder to link with the secondary radar that measures altitude and speed. When there was no response from the pilot either, the officials sounded a red alert. We tracked the aircraft till 4am but couldnt find out what type of plane it was and to whom it belonged. We didnt even know whether it had the standard equipment for voice communication with the ATC. So we contacted the Indian Air Forces liaison unit, a senior airport official said. UFOs : The Best Evidence : Government Cover Up !